Pairing: LeoxVenus, RaphxLisa, DonxPurple, MikeyxClover. Nari - 11, Larota - 11, Talena - 10, Amoly - 9. Venus; "It was already four years when all this happened, the clan reunion, a new beginning, own family, the children, but anyway I am happy ... I have one daughter called Nari, he is 11 years old, blue-ribbon turtle, very gentle in nature and take All account, Nari resembles very much Leo and me. Lisa and Raph has also already have a daughter, named Larota ... Their daughter is a hard-headed and really knows how to offend, but knows how to be kind. Purple and Don is the daughter of one year younger, a girl named Talena ... He is from a small to a very wise, he has inherited skills Don and Purple. Mikey and Clover is a daughter two years younger when I, a girl's name is Amoly ... She is a lively and a little bullied song from everyone, inherited skills clearly Mikey and Clover. And...."
Venus was to continue writing the pretty girl's voice interrupted him. Nari; Mom, will you take a look when I train? Venus; Of course, darling. Is your dad already there? Nari; Yeah, all the others have already, come on! Venus and Nari arrived at the Dojo room, where all the others were already waiting. Larota; Finally you came! What took you? Nari; Mother was-written something, I do not know what. Amoly; For real? What she was writing a book? Talena; Do you think that the Nari consider what his mother writes? Amoly; I do not know, but I for one would read it if it should be something of interest when. Larota; Somehow I guessed that. Venus; Okay, enough to talk! We came here to practice. Purple; Look closely at what we show you. Lisa; And repeat the same movement. Larota; Who does not intelligence. Daughters watched as their mother practiced against their fathers. Venus; Okay, now it is your turn. Amoly; against whom we train? Lisa; You you practice against your father. Larota; Okay, Hehe, this will be fun. Daughters began to practice against their fathers. They took many times the ground, but did not hurt themselves. Until it was gone half a year. The girls were back to back, that is trapped. Amoly; Help, we need to come up with something. Nari looked at all the fathers and also of theirs. The girls exchanged their opponents and began to fight each other in dad's. In the end, came a familiar voice ... and the battle ended. All the girls went and hugged Splinter. Splinter looked at his sons. Splinter; Did I come at a bad time? Leo; You did not come, father. 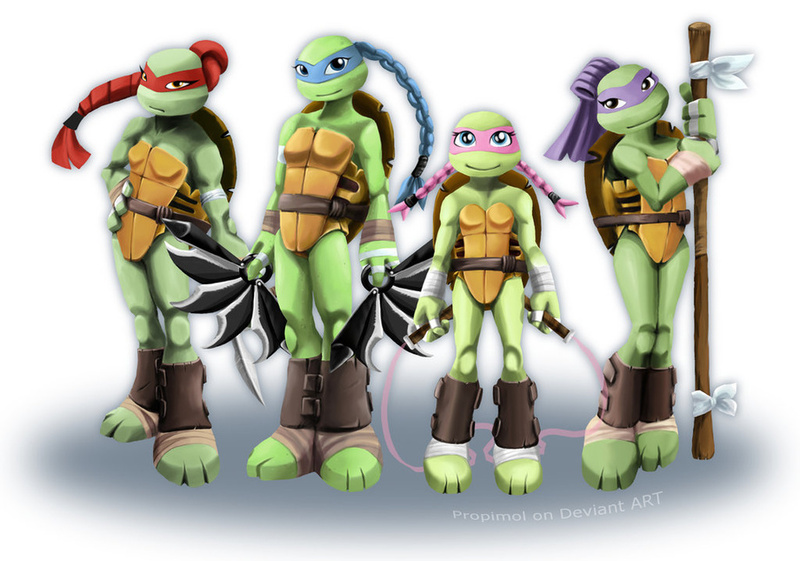 Raph; We were just finishing up. The girls arrived in the room and saw the Splinter. Venus; Splinter it has been a while since I saw you last. Purple; Is Nasa with you? All adult turtles girl cried. Nasa; Sorry to startle you? Hehe. Clover; But we are still alive. Amoly; You can now take a family hug? All hugged each other and wished Splinter and Nasa back home to a large expedition. Amoly; Grandpa! How was your trip? Splinter; It went pretty well, thanks for asking Amoly. Nasa; We had a wonderful trip together. Nari; It is a pleasure to hear. Splinter and Nasa looked at each other and flushed. Larota; Do you have something to tell us? Talena; You seem a bit mysterious. Nasa; Let just tell them, Splinter? Nasa; Amoly, Nari, Larota, Talena ... You get a brother. Talena; That is wonderful news! Nari; Have you chosen a name yet? Larota; What is then the boy name? Nasa; The boy name is Remy Hamato. Clover; Oops, the clock is already a lot. Mikey; It's time to make dinner. Amoly; May I come to help? Nasa; Just forgot, this is for you Amoly! Nasa; And this is for you Talena. Splinter; These are for you Loreta. Nasa; And these are for you, this package .. We think that you are ready, Nari. Nari opened the package, and all were surprised. Nari; Are these my katanas? Nari; Thank you for Splinter and Nasa! All the children went to try out their talents. Leo; Sensei, you should not have. Lisa; Those gifts will certainly cost a lot. Splinter; It is for at least what we both can do the graduating children. Nasa; Yes, your ninja training has ended, we have already taught you all things what I know how to. Splinter; It is your job to teach your child ninja skill and clan traditions.